When you buy Buddha statues for home, you’re buying a spiritual item to help you meditate. Buddha statues are probably the most important type of spiritual sculptures you can have in your home or garden. I personally always recommend incorporating a Buddha statue when you are creating your meditation room. Buddha statues remind us of the wisdom of the Buddha and of the importance of the Budhist dharma. When you buy Buddha statues for home, you’re buying yourself a reminder to live the enlightened life, to be compassionate, and to meditate. But there’s a lot more to a meditating Buddha statue than that. Different meditating Buddha statues mean different things and they show different Buddhist mudras. Then there are meditating Buddha statues and alternative choices like a Buddha head. All meditating Buddha statues have their own story and their own meaning. And if you want to choose the perfect Buddha statue to live in your home or garden with you, you might like to know what different statues represent. Some meditating Buddha statues show Buddhist mantras. Remember, when you buy Buddha statues for home, you’re getting a sculpture that will accompany you on your spiritual journey. So it’s important to choose one you love. 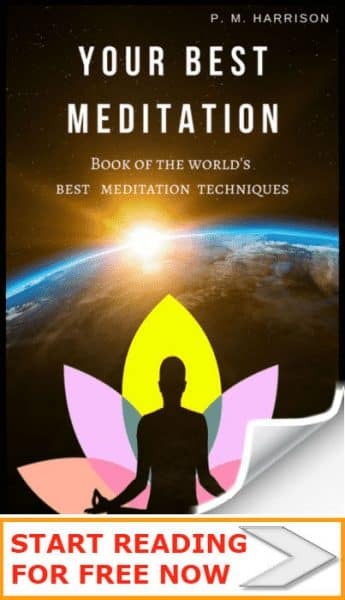 As a meditation teacher. I love helping people chose the best Buddha statue. Let me help you find yours. If you want to buy the best Buddha statue for your home, ask yourself these 4 questions. 1. Why are you buying a Buddha statue? 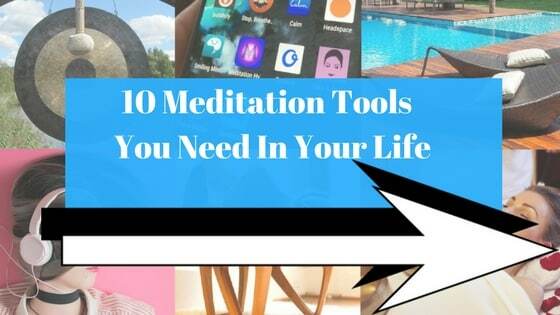 In my article on creating the perfect meditation space, I discuss why Buddha statues are one of the most important meditation furniture items you can buy. Some people buy statues just for the decoration. Others want a reminder of enlightenment, of mindfulness, of compassion, or something else. Why do you want to buy a Buddha statue? Answering that question will steer you in the right direction. For instance, if it is just for decoration you can go by looks alone. If, on the other hand, you want a statue that represents inner peace, you might like a statue of Buddha sitting under the Bodhi tree or something to that nature. Write down the main reason why you are getting a Buddha statue. Make sure the Buddha statue’s meaning reflects your goal. 2. What’s your ideal Buddha statue’s sale price? Obviously, when you are budgeting you also want to leave some change for the other meditation tools you need. Buddha sculptures for sale range from around ten bucks to thousands. Some are under priced. Some are overpriced. How are you to know the difference? To make sure you get a good quality Buddha statue sale for your price point, look at the details. If your meditating Buddha statue is $10 it’s only going to have very minimal features. But statues that costs thousands should show very close detail and be very realistic. Materials are also very important. Something made of silver or gold. A gold or silver Buddha will also last forever, where a clay one will not. If you buy a cheap Buddha statue it will be made of material with a short lifespan. So if you want something that lasts, you will have to pay a bit extra for it. 3. What should your meditating Buddha statue mean? It’s important that the meditating Buddha statue’s meaning reflect your goal. And one of the main ways that a Buddha statues meaning is expressed is through the mudra. Poses (mudras) mean different things. For instance, the DharmaChakra Mudra signifies the teachings of the Buddha. If you want your Buddha statue to represent the right meaning, check which mudra it is in. 4. are you buying a meditating Buddha statue for home or garden? Lots of reader loved my DIY Zen Garden article. And one of the favorite things to put in a Zen garden is a Buddha statue. But a statue for the garden is not the same as a statue for the home. Buddha statues for the home can generally by left alone with absolutely no worries (at least until the cat runs into them). Statues for the garden, however, have special considerations. For instance, you will need to consider the material it is made of and whether it would survive a rain storm. Where will you put your Buddha statue? What room will it go in? What are the colours in that room? What is the mood of the room? 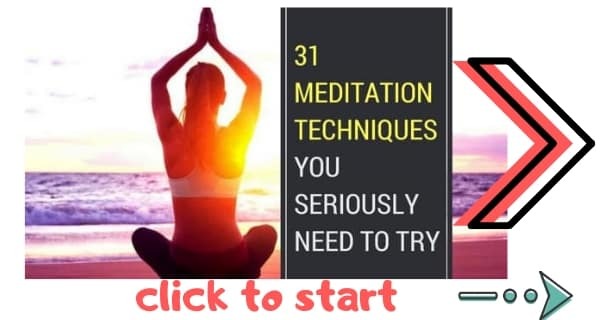 Make sure the Buddha statue matches the other meditation furniture you have. Remember you will be meditating on this statue (using a meditation such as Bhakti technique). So it is very important that you be happy with your Buddha statue. So, what are the best Buddha statues for sale today? 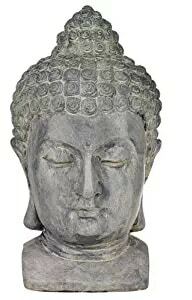 To help you choose, I’ve shared my favorite Buddha statues for sale by price-points. They are of various styles of design, some being artistic others more traditional. And each depicts the Buddha in a different pose. I recommend picking one up to add to your meditation room, or perhaps even picking all four up as they make for wonderful decorations for the home. This meditating Buddha statue is 8 inches by 6 inches and is a perfect addition to any meditation space. 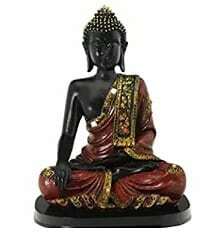 It’s one of the best Buddha statues for home. The statue has a bronze finish with a silver robe. The colours go really well together and the Buddha’s face looks very relaxing, helping you to achieve a deep state of meditation. This meditating Buddha statue is sitting in lotus position with the hands in Cosmic Mudra (Dhyani), which is the mudra used for contemplation and insight. 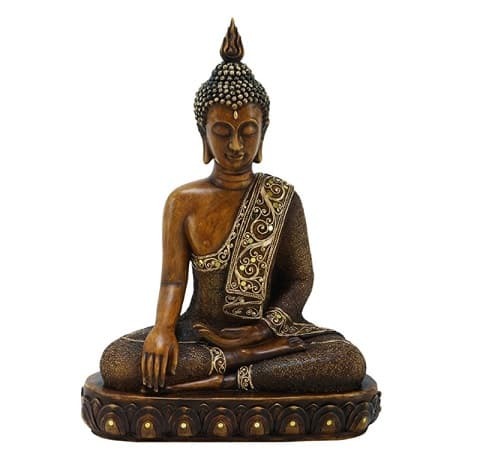 This is a beautiful brown and gold meditating Buddha statue in which Buddha is sitting meditating with his eyes closed. In this statue, Buddha is holding his hands in Earth Witness mudra. This is the mudra Buddha was using when he found enlightenment under the Bodhi tree. The statue has an aged look almost like wood and the skin is shiny. Sequins add decoration and beauty to the Buddha. I like the fact that the aged look helps to represent the wisdom that Buddha found while under the Bodhi tree. It’s a beautiful Buddha statue for home. This meditating Buddha head statue for sale on Amazon shows Buddha in contemplation. 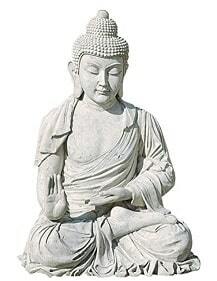 It is a great Buddhist sculpture if you want to introduce a calming presence into your home or garden. For the quality of the statue it is very reasonably priced. The stone faux finish is beautiful and reviewers say it looks great in the garden. One of the best tings about this Buddha head statue is the detail. It is a very precise statue with intricate details. The finish is waterproof, too, so it will be fine even in damp or rainy environments. This statue is surprisingly light because it is hollow inside. It also looks a little grayer than the picture. 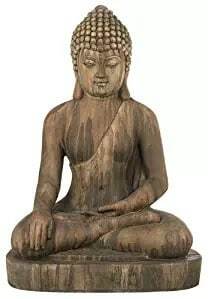 This is a beautiful Buddha statue for home or garden. This is one of the best artistic style Buddha statues for sale today. The clothing is pink / green and is designed very artistically. The Buddha is depicted in Bhumispara mudra, the mudra that the Buddha was performing when he achieved enlightenment under the bodhi tree. The artistry and symbolism of this Buddha statue makes it perfect for meditation. Another great meditating Buddha statue for home. This sandstone Buddha statue again depicts Buddha sitting in Earth Witness mudra with the hand touching the eart. This is a larger statue at 29 1/2″ high x 21″ wide x 15″ deep and weighs 20 lbs. As such it is a good decorative piece for the garden. It is Resin with a grey stone finish that looks like an antique. The resin is thick and heavy and will easily endure a storm. If you’re looking for a focal-point that is reasonably inexpensive, this is a fantastic choice. Definitely one of the best Buddha statues for home. This is a high quality Buddha sculpture for garden or home. It’s a big Buddha at 35″Wx32″Dx48″H and weighing 72 lbs. It is hand-cast out of real stone and a very high quality resin, which is important for garden Buddha statues because the material is durable. 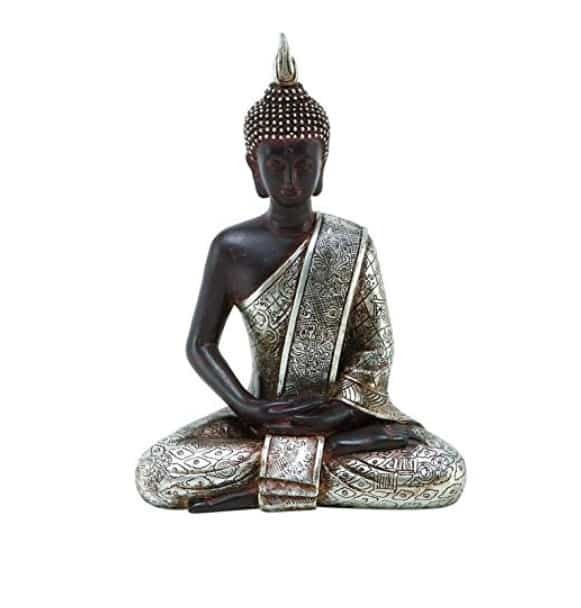 Interestingly, the meaning of this sitting statue according to the product description page is all about inner peace, but that is not what the Buddha depicts. The hands of this Buddha are in Abhaya mudra, which is the mudra used for fearlessness. This garden Buddha sculpture will hold up well in both heat and rain. 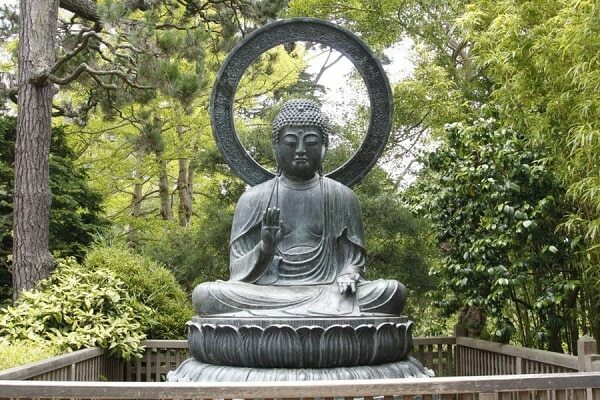 And it is in my opinion the very best Buddha statue for gardens. Which Buddha statue to buy? I want them all! Buddha statues are truly beautiful, aren’t they? And there is a statue for everyone at every price range. There are cheap Buddha statues and there are luxury Buddha statues. I always recommend getting a Buddha statue that is valuable but affordable. You want a statue that you will value without breaking the bank. And of course, you will also want to budget for the other spiritual products you need, such as a Budhist mala necklace. Which Buddha statue is your favorite? Nice well explained all the points. And yes it is necessary to ask these questions yourself before buying Buddha Statues or idols.